Ezio Auditore "Florentine Scarlet" & "Caspian Teal"
When NECA released their first Assassin's Creed figure, I'd never played the game - I bought the toy just because it looked cool. Now here we are, five and a half years later; I just finished the Ezio trilogy, and it's time to review NECA's final AssCree release - a two-pack covering both Brotherhood and Revelations. 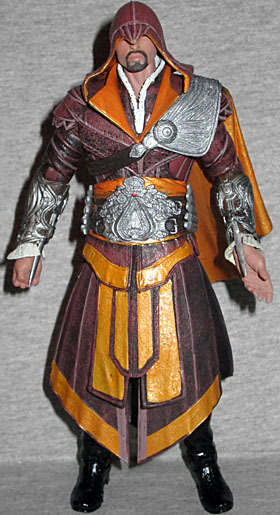 The Brotherhood figure, "Florentine Scarlet" Ezio, is the same sculpt as the previous AC:B figures, just done in a different color. No, that's not some lazy cop-out on NECA's part: one of the gameplay mechanics allowed you to customize your character by going to a tailor shop and dyeing his clothes. The actual design of the costume remained the same - it was just the color that changed. Honestly, it's surprising NECA didn't try to milk that feature harder than they did. A lesser company would have. You'd be staring at shelves full of repainted Ezios. Since the sculpt is the same, everything we said about it in the previous review holds true: the detailing is good, but the specific design is based on promotional artwork rather than in-game renders, so the armor isn't really one you can put on the character. 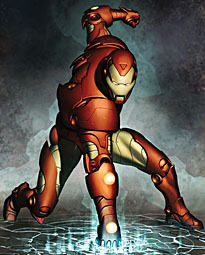 The dark red outfit with its gold accents and the spots of silver armor make him look like Renaissance Iron Man! And heck, thanks to all the articulation NECA put in their Assassin's Creed toys, you can even get him into the Iron Man pose! Better than most Iron Men, in fact. He has a balljointed head, balljointed neck, lateral hinge shoulders (hidden by the shawl), swivel/hinge shoulders, swivel biceps, swivel/hinge elbows, balljointed wrists (to facilitate swapping them out, but they function more like swivels), hinged wrists, hinged torso, swivel waist, swivel/hinge hips, swivel thighs, double-hinged knees, swivel boots, hinged and rocker ankles, and hinged toes. Sadly, his only accessories are the hidden blades and four extra hands. When these figures were first uncovered, "Ketchup and Mustard" Ezio had no appeal for me: it was his buddy who looked interesting. 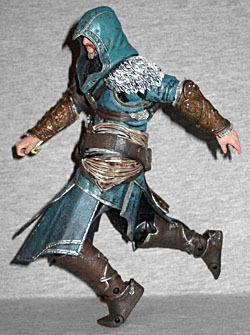 "Caspian Teal" Ezio comes to us from Assassin's Creed: Revelations, which jumps forward four years from the end of Brotherhood, and changes locales from Rome to Istanbul Constantinople. Naturally, a new game means new costumes, and a new costume means a new sculpt - and this set was our first introduction to it. The quality of the sculpt is just as high on this figure as on the others - it was sculpted by the same guy, so that makes sense. 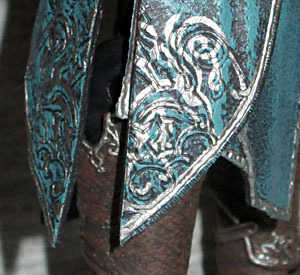 The cloth wrinkles naturally around the joints, and all the patterns on his skirt and boots are actually etched into the suface of the toy. Unlike the previous Ezios, this one's outfit is real: he's wearing the starting gear, what you're given before even upgrading to the weakest armor once you reach Constantinople. The most blatant difference between Bro and Rev is that in the latter game, Ezio has fur around the edges of his armor - and at this point, when he only has one pauldron, a furry pad on his shoulder. The head is also new. After the inter-game timeskip, Ezio was wearing a full beard, so that needed to be sculpted. He's also showing signs of age, with deep lines starting to form on his cheeks and around his eyes. His hood comes down lower on his chest, allowing the striped "interior" to be seen. It's like he's wearing a big fancy scarf! The articulation continues to be superb. 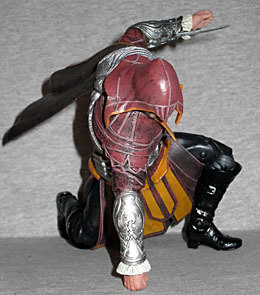 Despite being in his mid-50s, Ezio hasn't lost a step, so the figure has hinged toes, hinged ankles, double-hinged knees, swivel thighs, swivel/hinge hips, swivel waist, hinged torso, hinged and balljointed wrists, swivel forearms, hinged elbows, swivel biceps, swivel/hinge shoulders with lateral hinges in the chest, and a balljointed head. Nothing was stuck or broken, but the hands are molded from the same blue plastic as the rest of the figure, and the paint scrapes off as you move them. Amusingly, this figure is about ⅛" shorter than the other - it's not that he's shrinking as he gets older, but that the Brotherhood Ezio was wearing heels, while Revelations Ezio is in flats. 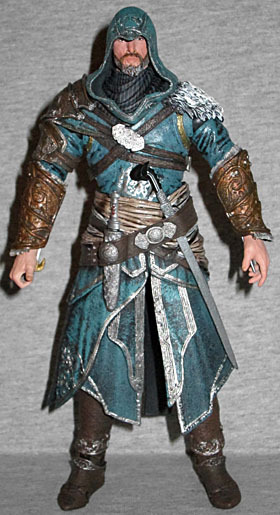 The Caspian Teal is very close to the normal color of Ezio's suit - because he was aging, they opted to dress him in gray rather than white, which seems kind of insulting. The blue is very nice though, and the silver accents set it off nicely. The apps don't line up very well on the right side of the skirt, but that would be hard to get it spot-on without spending an hour doing it by hand for every figure. Ezio gets one bonus hand (a left fist), though the packaging doesn't mention it - you can recognize it's his by the paler skintone. 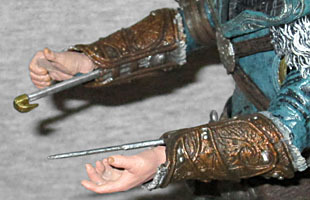 He has one hidden blade on his left arm, while his right arm has the hookblade - the new device he was introduced to by the Turkish Assassins. In addition to murder-stabbing everyone you meet, the hookblade allows you to climb more easily, to use Constantinople's many conveniently placed ziplines, or to grab guards while in the middle of a fight. And all this, despite only adding about 3" to Ezio's reach. He's also got a yataghan sword (a real weapon that is your starting sword in the game) and the Macedonian dagger. Both can be stored in his belt. 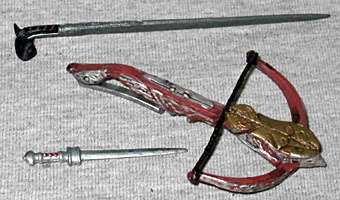 The packaging also indicates that the crossbow belongs to this figure, but it really fits better in one of Florentine Scarlet Ezio's hands. I saw the normal release of Revelations Ezio before this two-pack made it to shelves, but I was still committed to buying the double. Why? Well, I've already got enough Ezios in black or white - getting two in fancier colors is a nice change. Plus, in the time between when I bought this set and when I'm finally reviewing it, I've actually played the games in question, which makes me appreciate NECA's work all the more. This is their last Assassin's Creed release, with the license now going to McFarlane Toys, and Toddy's going to have some big expectations to live up to.